Venturefest South West champions the most cutting edge innovation, technology and entrepreneurship coming out of Devon. 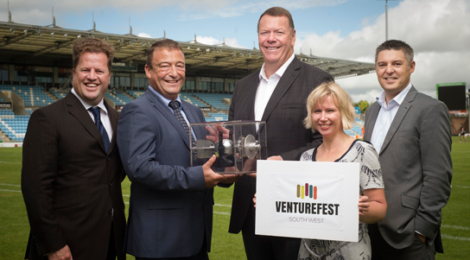 Venturefest South West champions the most cutting edge innovation, technology and entrepreneurship coming out of Devon, Cornwall and Somerset in 2016. The October event, the first of its kind in the South West, brings together talented small enterprise innovators and entrepreneurs from across the region along with investors on the lookout for emerging talent. At the Innovation Showcase, Venturefest South West will host companies at all stages of growth exhibiting their innovative products, services and technology in an interactive area giving delegates the chance to touch, try and experience the latest designs from the region. Venturefest will also host the final of Pitchfest, which is open to start-ups and growth stage businesses who will compete to win business support. Pitchers will compete on the day with just five minutes each to impress a panel of investors and experts as well as the audience. Those interested in applying to take part in Pitchfest should visit the Venturefest website for details. The event is part of the larger Venturefest network which has events running across the UK. It is free to attend and is being held at Sandy Park, Exeter. For more information, and to register, click here to visit the Venturefest South West website.